As it was 700 million years ago: good job things warmed up a little. When we see the term ‘AGW’, we understand those that propound it to hold “global warming” as an irrefutable fact. It is, however, a theory with which there is only one problem: and that’s the evidence. And it’s the lack of evidence for global warming that appears to have shifted the terminology to “climate change”: a tautology if ever there was one. Of course, the climate “changes” – change is endogenous to the model. Whether that change is significant or “dangerous”, as the most strident hysterics would have us believe, is yet to be seen. Humans have tolerated severe ice ages and, somehow, miraculously managed to survive. If the planet warms, as we’ve been lately warned, STT is pretty confident we will survive that too: it’s called “adaptation” – a feature of humanity, oft referred to as “ingenuity”. However, in the main, we leave the topic of global warming or climate change (whichever is your poison) to others. STT takes the position that man-made emissions of CO2 may increase atmospheric temperatures. But we don’t concede that wind power has made – or is even capable of making – one jot of difference to CO2 emissions in the electricity sector; principally because it is NOT – and will never be – an ‘alternative’ to conventional generation systems, which are always and everywhere available on demand (see our post here). Let’s assume, as we do, that man-made CO2 emissions in the electricity sector are a problem. Then the only presently available solution is nuclear power; unless, of course, you’re prepared to live in Stone Age darkness. Our attack is directed at a meaningless power source; that is insanely expensive, and utterly pointless, on every level. For those on both sides of the argument (including “AGW deniers” as they get referred to) that foolishly connect industrial wind turbines with global warming (or climate change) they, in effect, box themselves into a logical corner. On the one hand, if the AGW hysterics are wrong (and icebergs start turning up in Port Phillip Bay), then, applying their (by then failed) man-made CO2/warming argument, we should scrap every last (planet cooling) wind turbine and start burning coal and gas as fast as humanly possible to warm the joint up, in order to prevent the next ‘big freeze’. On the other hand, if the AGW “deniers” are wrong, temperatures start to rise, and Australia looks set to become a boiling desert devoid of all life forms (save card-carrying “Greens”, of course), then the hysterics will claim absolute licence (if not high moral imperative) to carpet this, and every other country, in an endless sea of giant industrial wind turbines. Having pinned their arguments against wind power on the basis that CO2 caused AGW is a furphy, the “deniers” would be forced to logically concede their opponents’ case; and, with it, to also concede the need for a completely wind powered electricity system. Hence, STT seeks to completely disconnect claims for and against global warming, and wind power generation. As wind power can only ever be delivered (if at all) at crazy, random intervals it will never amount to a meaningful power source and will always require 100% of its capacity to be backed up 100% of the time with fossil fuel generation sources; in Australia, principally coal-fired plant. As a result, wind power generation will never “displace”, let alone “replace” fossil fuel generation sources. 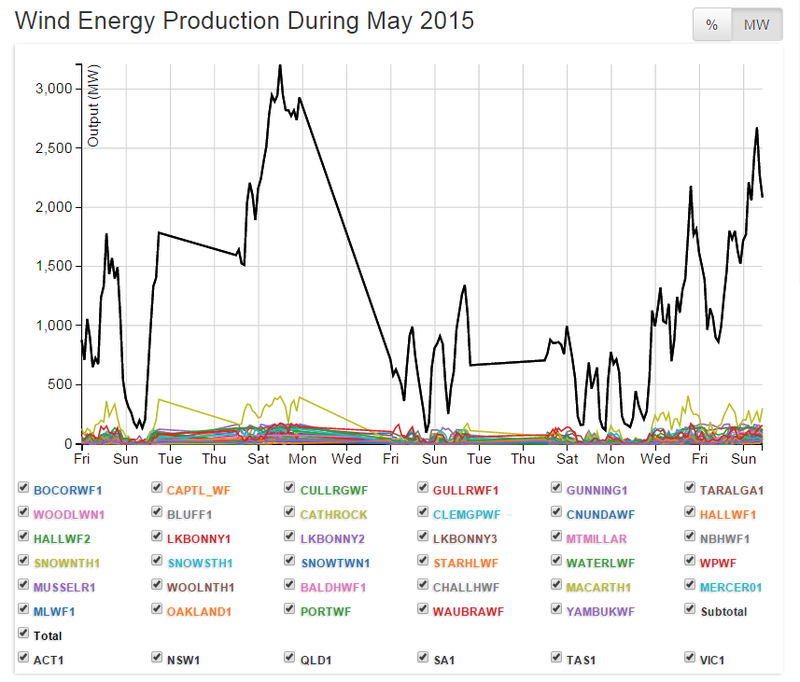 Wind power isn’t a ‘system’, it’s ‘chaos’ – the pictures tell the story: this is the ‘output’ from every wind farm connected to the Eastern Grid (based in NSW, VIC, TAS & SA – and with a combined installed capacity of 3,669MW) during May last year. Consider a country where its electricity supply was exclusively based on wind power generation; a place where businesses would attempt to run around the vagaries of the wind; where houses would be well-stocked with candles and their occupants left to keep food cold with kero-fridges or iceboxes – and those homes otherwise run on wood, sticks or dung, used for cooking or heating. Sounds like fun, doesn’t it? As soon as that country had the chance (due to the availability of technology and/or as a process of economic development) it would build a system based on power generation sources available “on-demand” (ie coal, gas, hydro, nuclear, geo-thermal). Its people would then be able to enjoy around the clock illumination; factories could run to the clock, and not the weather; homes would be heated and cooled according their occupants’ needs, making life safer and more comfortable (no-one need be frozen to death or expire from the heat because the wind stopped blowing); economic development and prosperity would follow, as night follows day. Placed in the practical context of the needs of a functioning society, wind power can be seen as the patent nonsense that it clearly is. If a country didn’t have a conventional power system (as we have), it would build one, anyway. Try living without mains water and sewage systems (which require a large volume and constant supply of electricity for pumps, treatment works, etc); stumbling around suburbs and cities at night without street lighting; and driving without traffic lights and other traffic control systems. It’s these little ‘conveniences’ that wind and solar cultists ignore when they chant that, with a few batteries, we could all run on wind and sun. A sea of solar panels on the roof and a Tesla battery might (at ludicrous cost) power a home for a few hours after dark, but that combination will never power whole functioning cities, or economies. Despite the railing of our critics, STT isn’t backed by BIG COAL, BIG OIL, BIG GAS or BIG ANYTHING. However, we’re happy to announce that this post, the computer we used, the computer you’re using and the internet that connected us, for that process to occur, were all built with and powered by some or all of the aforementioned (as we pushed the button to publish there wasn’t a breath of wind, and the Sun was setting, as it does most days). Energy matters; our lives would be pure misery without it. The chances of surviving a ‘runaway’ climate (in what ever direction it might happen to bolt) critically depends on having affordable, reliable and secure power generation systems. As this little analysis shows, it’s not climate change that threatens existence, it’s a lack of meaningful energy. AGW or climate change is not the big problem many claim. The perceived scare of AGW has been used by sub-groups in the United Nations to bluff wealthy industrialized nations into transferring money to poor often times corrupt nations. Monies gained from this mechanism have not been invested in the root cause of AGW (if in fact any exists.) At the same time over $1 trillion USD is spent worldwide annually on climate change studies, consultants, related government agencies, and the rapidly growing but totally ineffective green and renewable energy industry. This has also lead to the emergence of the carbon trading brokerage industry. This is based on fraudulent science as CO2 has an extremely small “greenhouse” effect far exceeded by water vapor from the oceans. Only fossil hydrocarbon fuels and nuclear energy can supply material amounts of energy due to their many orders of magnitude higher energy flux densities than so called renewables. Well over half the world’s economically viable recoverable fossil fuels have been consumed while over 3 billion human inhabitants live in “energy poverty:” over 1.5 billion without electricity. Once fossil fuels are depleted beyond the point of economically viable production there is only one energy source available to provide the Earth’s energy needs. That is the conversion of matter into energy as formulated in the equation E=mc2. Man must learn to generate energy based on his knowledge of the laws of physics and the interchangeability of matter into energy. Today we have started with the baby step of nuclear fission. Fission is practical and works today but is unsustainable due to radioactive waste issues. Therefore, we must immediately invest in the experimental understanding of the science leading to the successful demonstration of controlled atomic fusion followed by the R&D needed to commercialize it. Fusion is 100% safe, uses virtually unlimited fuel cycle non-radioactive light element components, and produces no significant radioactive byproducts. In the alternative, man will run out of fossil fuels. AGW is then a 100% moot point because hydrocarbon fuels are not being burned in material quantities. Under these conditions worldwide population will shrink to preindustrial revolution levels of about 10% of today’s population or about 700,000 750 million people worldwide. 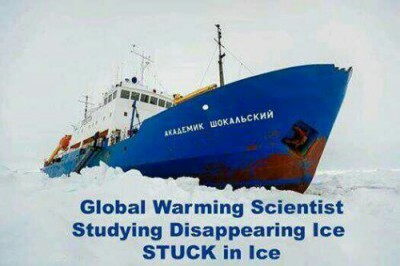 Anthropogenic Global Warming (AGW) or climate change is not the BIG problem its advocates make it out to be. Even if it could be proved that man is creating it through his use of hydro-carbon fossil fuels, it is not the truly BIG problem. Climate change has always been a part of the Earth’s dynamic atmospheric system. During the last 2 billion years the Earth’s climate has alternated between a frigid “Ice House” climate, today’s moderate climate, and a steaming “Hot House” climate, as in the time of the dinosaurs. 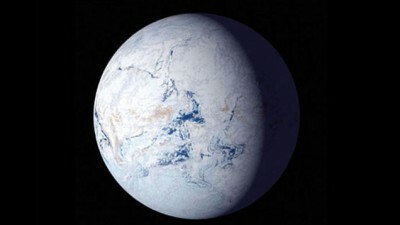 Principal contributing factors to the variability of the Earth’s median temperature and climate are the Earth’s complex orbit in the solar system as defined by the Milankovitch cycles, the sun’s variable radiated energy output, and geological factors on Earth such as undersea volcanic activity leading to inconsistent temperature gradients in the oceans. This chart shows how global climate has changed over geological time. Unfortunately, the potential threat of predicted future climate change has been used to transfer enormous amounts of money from wealthy nations to poor nations . This has enabled the survival instinct mechanisms of the climate change community. That includes governments, consultants, and scientific researchers who simply study the perceived problem and generate academic journal articles and reports. The ineffective green energy solutions manufacturing and service industry also owes their life…and government subsidies…to the climate change scare. No serious money raised by the “climate scare” has been spent on solving the BIG problem. The BIG problem is the fact that man was provided with about 400 years’ worth of hydrocarbon based fossil fuels which took several hundred million years to be created on Earth. The energy came from the Sun. Integrated over large amounts of geological time, daily Sun energy was converted into chemicals through plant photosynthesis. These chemicals can, in-turn, be ignited to release the stored energy through an oxidation reduction reaction with oxygen . Once they are gone they are gone in human life cycle terms. A housewife will say energy is what moves our cars, powers our airplanes, cooks our food, and keeps us warm in the winter – cool in the summer. You cannot power a world estimated to have 9 billion people by 2060 on energy produced from solar cells and wind turbines. They are not sustainable meaning they cannot create enough energy quickly enough to reproduce themselves (build more) and provide energy to man. The reason is that the amount of energy received from the Sun is far “too dilute” meaning a very small amount of energy is received per square unit of surface area for relatively short periods of time given the day-night cycle and weather conditions . Wind energy is a secondary effect of solar energy because wind is created by the atmosphere’s absorption of the Sun’s thermal energy in combination with the Coriolis force effect . This is based on the rotation of the Earth coupled with atmospheric pressure differences relating to elevation, mountains, and the like . Hydro power from dammed rives is also a secondary effect of solar energy. The movement of water in the Earth’s vast system of rivers occurs because of solar energy. This happens as seawater is evaporated, forms clouds, and ultimately water is released as rain and snow keeping our rivers full and flowing out to sea from higher elevations propelled by gravity. Unlike solar and wind, hydropower can consistently produce material but limited amounts of energy. The above illustration shows energy flux density in million Joules per litter on the left hand vertical axis with a scale spanning 10 to the 16th power in scientific notation. The horizontal axis depicts time on the top row from 0 years Common Era to 2200. The bottom row depicts worldwide population which is directly controlled by available energy to produce food, potable water and to provide for man’s comfort. 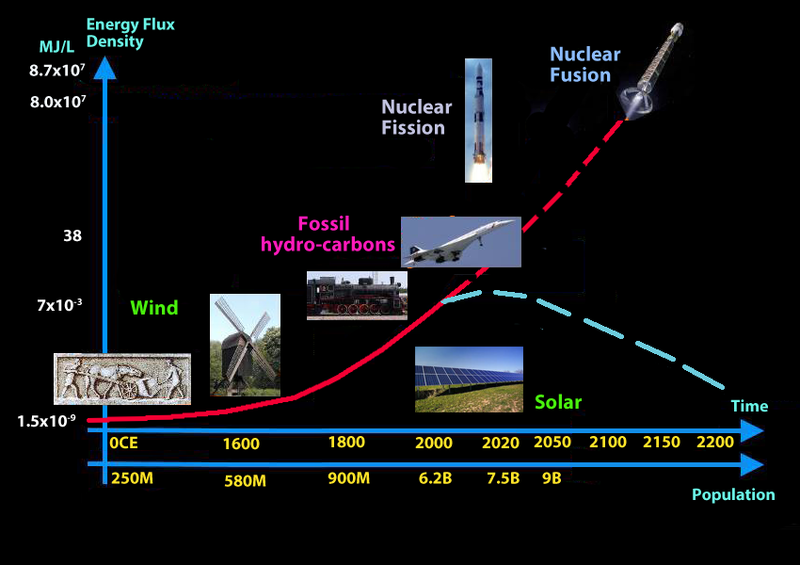 As can be seen, once fossil hydro-carbon fuels are no longer available in quantity, fusion energy must be developed or worldwide population will contract to that of the preindustrial age in the 1600s. Energy flux density refers to how much energy is contained per unit volume of an energy source. 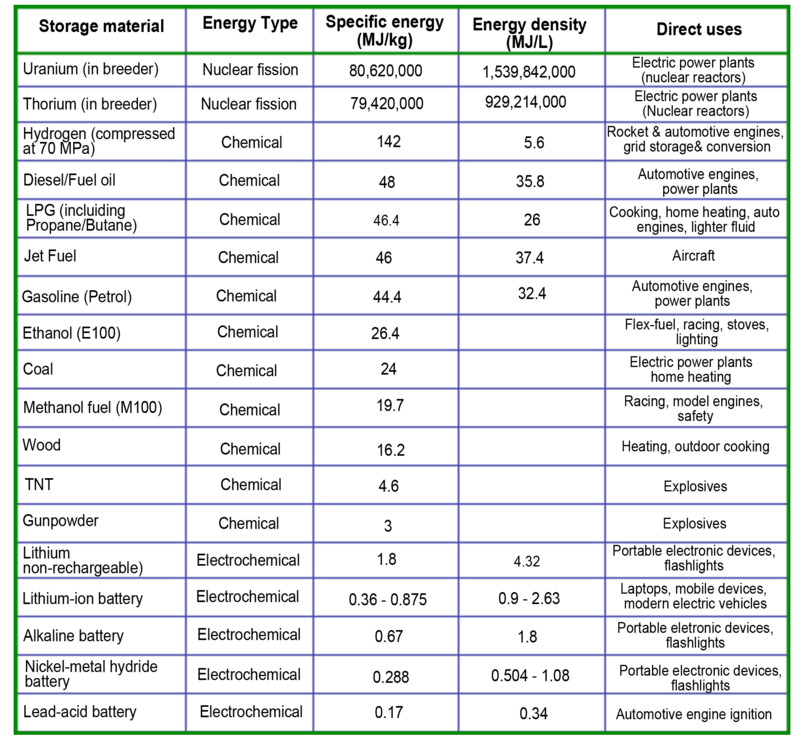 Appendix 1 below provides tabulation for various energy sources. We must begin to turn to what Dr. Steve Cowley in the UK calls “energy from knowledge;” the conversion of mass into energy . Albert Einstein formulated the relationship between energy and mas (matter) in his famous equation E = mc2. This means that a very small amount of mass is equal to a very large amount of energy as explained by Dr. Einstein in his own voice . We must solve energy for the long term through the conversion of matter into energy. No other energy source has a suitable energy flux density to provide our electricity, transportation, potable water and agricultural needs once fossil hydro-carbon fuels are no longer economically viable to recover due to depletion . We must begin now because it will take several decades to master the science. We began this journey when we developed nuclear fission power. However nuclear fission is not a long term solution for several reasons; most notably the long-term radioactive waste it produces. The next step is the development of nuclear fusion. Fusion is much different than fission [10–11–12]. It uses light elements in the fuel cycle, is fail safe, and can do no environmental harm. It has the highest flux density of any energy source short of matter anti-matter annihilation. It will take several more years of pure experimental scientific research to demonstrate a sustained fusion reaction in the laboratory producing a net energy gain meaning more energy is produced than was “pumped in” to start the energy production . Once controlled fusion is proven in a controlled environment, regardless of how expensive and complicated the reactor mechanism and facility is, man’s ingenuity will take over in the private sector. The complexities and costs will be driven down just as turn of the 20th century vacuum tubes gave way to transistors and later microcomputers-on-a-chip. That is the BIG problem. If we do not solve this, in 50 to 100 years our coal, oil, and natural gas resources will no longer be economically and environmentally recoverable. Then mankind reverts back to life in the 16th century. If we do not solve energy the entire argument of being good environmental stewards of the Earth is moot. Why? Because in less than 100 years we will no longer be burning fossil hydro-carbon fuels. Global warming and climate change caused by man is no longer an issue. The problem takes care of itself. In a few thousand years the processes of nature…geological and geo-chemical…will erase most signs of our past industrialized existence. If there are not sizable numbers of cognitively intelligent humans capable of thinking and distinguishing beauty, it is a nonconsequential point as aliens are not flocking to our planet. No one or no thing will ever know the difference. Which begs the question: “Is there intelligent life on Earth?” This author believes so. As Bill & Melinda Gates recently stated in their recent foundation’s annual open letter, our youth needs to be challenged to produce what they called an “energy miracle” . This is the biggest problem man faces. Climate change…if caused by man…automatically reverses itself over the next 100 years. But if we do not solve energy mankind’s population will contract by a factor greater than 10 over the course of the following 100 years. Collectively, we as a species must recognize this reality and begin the energy race today. Another Climate Alarmist Admits Real Motive Behind Warming Scare, Investor’s Business Daily, March 29, 2016. Tamarkin, Tom D., Energy Basics; Where does energy on our planet come from?, Fusion 4 Freedom. Heats of Combustion, UC Davis Chemistry Wiki. Lawson, Barrie & Tamarkin, Tom D., Going Solar-System Requirements For Solar Generated Utility Baseload Power, Fusion 4 Freedom. Consequences of Rotation for Weather; Coriolis Forces, Universe of Tennessee Knoxville. Atmospheric Pressure at Different Altitudes, AVS Science & Technology of Materials, Interfaces, & Processing, https://www.avs.org/. Fusion energy with Professor Steven Cowley, Culham Centre for Fusion Energy, UK. William Tucker, Ph.D., Understanding E = MC2, Dr. Albert Einstein in his own voice & explanation, Energytribune.com. Tamarkin, Tom D., Energy Basics, Comparison of fuel energy flux densities, Fusion 4 Freedom. Duke Energy Nuclear Information Center, Fission vs. Fusion – What’s the Difference? Lawson, Barrie, Nuclear Fission Theory, Fusion 4 Freedom. Lawson, Barrie, Nuclear Fusion-The Theory, Fusion 4 Freedom. Tamarkin, Tom D., Fusion Energy; Too Important to Fail – Too Big To Hoard, Fusion 4 Freedom. Tamarkin, Tom D. 2060 And Lights Out: How Will America Survive Without Oil?, Inquisitir Special Report, http://www.inquisitr.com. Gates, Bill & Melinda, Gates Foundation Annual Open Letter, James, Murray, Guardian, February 24, 2016. Energy density is the amount of energy stored in a given system or region of space per unit volume. Specific energy is the amount of energy stored per unit mass (weight.) Only the useful or extractable energy is measured. It is useful to compare the energy densities of various energy sources. At the top of the list is fusion followed by nuclear fission and then hydrocarbon fuels derived from petroleum, coal and natural gas. At the bottom of the list are batteries which either generate energy or store energy as well as “renewable energy” such as solar. The energy released by fusion of 1 atom of Deuterium with 1 atom of Tritium is 17.6 Mev = 2.8 X 1012 Joules. The energy liberated by the fusion of 1 Kg of Deuterium with 1.5 Kg of Tritium is 2.8 X 1012X 2.99 X 1026 = 8.3 X 1014 Joules = (8.3 X 1014 ) / (3.6 X 1012 ) = 230 GWHours. 1 Deuterium is a naturally occurring isotope of hydrogen readily available from sea water. 2 Tritium is produced in the fusion reactor from Lithium as part of the fuel cycle and energy exchange process. Lithium is an abundant naturally occurring element. 1 How much solar power per cubic meter is there? The volume of the space between a one-meter-square patch on Earth and the center of our orbit around the sun is 50 billion cubic meters (the earth is 150 billion meters from the sun, or 4,000 earth circumferences). Dividing the usable 100 watts per square meter by this volume, yields two-billionths of a watt per cubic meter. Sunlight takes about eight minutes(499 seconds) to reach the earth. Multiplying 499 seconds by twenty-six billionths of a W/m3 reveals that solar radiation has an energy density of 1.5 microjoules per cubic meter (1.5 x 10-6 J/m3). 2 The only way to extract thermal energy from the atmosphere is to construct an insulated pipe between it and a reservoir at lower temperature (preferably a much lower one). This is how geothermal heat pumps work. Typical ground temperature is 52F (284 K). On a 90F day, such a system has a peak efficiency of 7%, and a power density of only 0.05 mW/m3(Stopa and Wojnarowski 2006): typical surface power fluxes for geothermal wells are on the order of 50 mW/m2 and have typical depths of 1 km. To find the energy density, a characteristic time must be included. The time used should be that of the time required for water being pumped into the ground to circulate through the system once. This number is on the order of ten days (Sanjuan et al. 2006). The resulting energy density is 0.05 J/m3, or roughly two to three orders of magnitude lower than wind or waves. 3 Wind is driven by changes in weather patterns, which in turn are driven by thermal gradients. Tides are driven by fluctuations in gravity caused by lunar revolutions. The energy densities of wind and water systems are proportional to the mass, m, moving through them, and the square of the speed, v, of this mass, or ½mv2. At sea level, air with a density of about one kilogram per cubic meter moving at five meters per second (ten miles per hour) has a kinetic energy of 12.5 joules per cubic meter. Applying Betz’s Law, which limits efficiency to 59% (Betz 1926), yields about seven joules per cubic meter. Thus, wind energy on a moderately windy day is over a million times more energy-dense than solar energy. There are two prevalent mechanisms for extracting tidal energy. In one system, barrages move up and down, extracting energy with the rise and fall of the tides. On the second type strategy, tidal stream systems act more like underwater wind turbines, extracting energy from tidal waters as they move past. As with wind, the energy of a moving volume of water is also ½mv2. Tidal systems have the advantage over wind systems in that water is approximately one thousand times denser than air. Their disadvantage lies in generally low tidal velocities of only ten centimeters per second to one meter per second. Thus, a cubic meter of water, with a mass of about 1000 kg, yields an energy density of about five joules per cubic meter for slow water1and five hundred joules per cubic meter for fast water2. These are also subject to Betz’s law and represent only peak values, so the average energy densities are closer to one-half of a joule per cubic meter to fifty joules per cubic meter, or about the same as wind. 1 kinetic energy (tidal low velocity) = ½ mv2 = ½ · 1000 kg · (0.1 m/s)2 = 5 joules. 2 kinetic energy (tidal high velocity) = ½ mv2 = ½ · 1000 kg · (1 m/s)2 = 500 joules. AGW is in the same realm of the Labor & Liberal parties both saying Prince Philip’s Greens support the other party – confused, bewildered & bewitched – & so confounded it’s craptained by, well craptains. With the French subs being nuclear designed, which wrapped in the Oz flag (Labor) or mimicking the CEC logo (Liberal) who is going to blink first? With SA having damned coal will they wind up like Tassie? The wind just blows just straight through the hole. Watch the STT space to see what pollies come to their senses. As for the LNP/LAB/GRN don’t hold your breath (Oh, but that’s a carbon reduction thing – to be or not…).